One of the most reliable ways to get a glimpse into future Apple products these days is by looking at the case manufacturers. 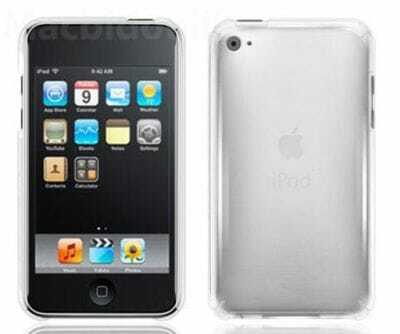 This is no different when it comes to the iPod Touch 4, as images have been leaked of the apparent case for the device. Hardmac unveiled the images earlier today, and also says that the same source also offered pictures of an iPod mini case last year, which also went to prove that the iPod would also come with a camera. Not much can be gained from these images, but what we can see is that it comes with camera and a flash. The iPod Touch 4 also looks very similar to the iPhone 3GS with a curvy back rather than the new type of flat-glass from the iPhone 4. What do you make of these supposed images of the iPod Touch 4? I think this is wrong because it doesn’t have the black area at the top left of the back for the wifi and why would apple keep the curved back when they could make it thinner and have a flat back and apple want all of their mobile products to be slim so I think this will not be the iPod touch 4 design at all. iPod touch 4G will have FaceTime and a front-face camera as well, because if you go on Wikipedia, type in 'iOS version history' and look at 4.1 beta, you can see 'Support for FaceTime on iPod touch'. Previous article HP Slate eStation Zeen: webOS, Android or Windows 7? Next article Koenigsegg CCXR Color or Clamped: What’s more shocking? HP Slate eStation Zeen: webOS, Android or Windows 7?